The Trump administration has not seen climate as a pressing issue for the U.S. Global temperatures could reach an irreversible tipping point in just 12 years if the world doesn’t act dramatically to reduce the amount of carbon dioxide released into the atmosphere, scientists warned in a new report. The dire assessment puts the spotlight on President Donald Trump and the Republican-controlled Congress. Trump and many of his most ardent supporters in Congress have questioned man-made climate change and the president could remain in office for nearly half the time the scientists say is crucial for action. But the United States government has not supported aggressive climate policies under the Trump administration. President Trump decided to withdraw the U.S. from the Paris Climate Agreement – an accord where countries pledged to drastically reduce greenhouse gas emissions. The current administration has moved to roll back most of the climate-oriented policies proposed by the Obama administration, proposing replacements in some cases which experts said won't go as far toward reducing emissions. The Environmental Protection Agency declined to comment on the UN report's findings on Monday. The UN panel's researchers found that “human caused” carbon dioxide emissions need to be cut by nearly half of 2010 levels by 2030 to stave off the worst effects of climate change. Scientists said “rapid, far-reaching and unprecedented changes in all aspects of society” are required to limit the possibility of irreversible environmental damage. The Trump administration has moved to protect coal producers and other energy sources like natural gas, saying that it is a national security risk to rely only on renewable energy. Many scientists, however, say one of the most efficient ways to curb global warming would be to drastically reduce the country's use of fossil fuels. Global temperatures have already risen an average of 1 degree Celsius, about 1.8 degrees Fahrenheit, above levels before the industrial age, according to researchers. 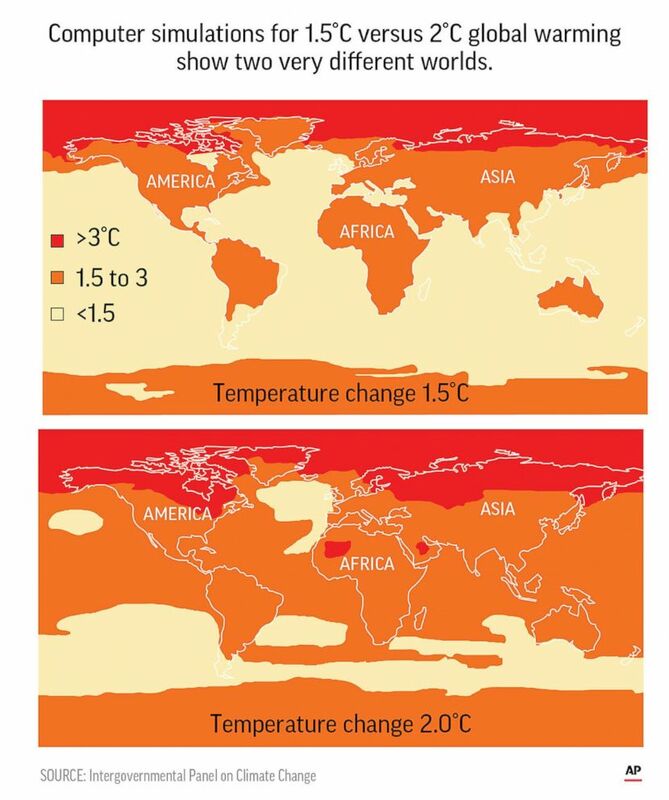 An additional half a degree warmer might not seem significant to the average person. But even that amount of change is predicted to wipe out coral reefs, threaten to melt Antarctic ice sheets that could contribute to rising sea levels that worsen flooding, cause the ocean to become more acidic and impact crops in some parts of the world. Michael Mann, an atmospheric science professor at Penn State University, says goals to stop warming at 1.5 or 2 degrees Celsius are often seen as a cliff but the reality is more like a minefield. Climate models can't predict exactly when irreversible impacts of climate change could be triggered but that we should stop moving in that direction as soon as possible. "We don't know where those tipping points are, we don't know how much warming triggers these effects. So that's another reason to stop this lurch forward," he said. Mann said the first thing the U.S. and other countries need to do is flatline the amount of carbon dioxide emissions from burning fossil fuels and accelerate the move to more renewable energy. He said we already feeling the impact of increasing temperatures as warmer oceans and sea level rise contribute to worse storms like hurricanes, but if we continue to release more carbon dioxide and other greenhouse gases that warm the atmosphere the storms like we saw this summer will only get worse. "The strongest storms are getting stronger because of the warming of the oceans and they will continue to do that," he said. John Holdren, a professor of environmental policy at the Harvard Kennedy School of Government and former science advisor to President Barack Obama, said there is no way to limit warming to 1.5 degrees C without early, aggressive action by every country. "This report is very hard-hitting in its affirmation that climate change is an urgent and potentially irreversible threat to the planet," he said. Holdren said it is very difficult to get action to reduce emissions without the federal government but the good news is the efforts from states, cities, universities, and private companies to meet the goals of the Paris Agreement even without the administration's leadership. That coalition, nicknamed "We're Still In," has even appeared at United Nations events separately from the official U.S. delegation. "I am not optimistic about our ability to hold the increase to 1.5. I think doing what the IPCC report describes as necessary to get to 1.5 would be almost miraculous in today's world starting with the fact that the US government is now the only country in the world that is not committed to Paris. It is an extraordinarily heavy lift to get to 1.5," Holdren said. But Holdren said that despite the specific goal in this report the effects of climate change will only get worse if temperatures continue to increase so it's important to take action to prevent the consequences from getting worse. He said that even though it's improbable that most countries will meet the goals set by the UN panel's report the glass is simultaneously half empty and half full because emissions have decreased overall. Mann said he is cautiously optimistic about trends to reduce carbon emissions but that we need policies to accelerate that trend and deal with warming that has already happened, which we don't see in the current administration or Republican leadership in Congress. "The single most important thing Americans can do within the next month would be to vote in this upcoming election and to vote on this issue of climate."